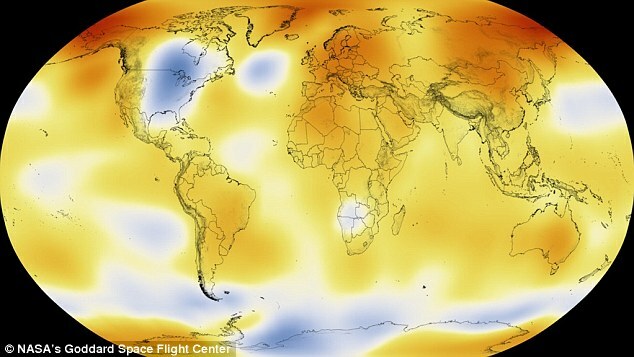 NASA and the NOAA agree: 2015 was a record-breaking Hottest year on record. The experts all agree: 2015 was a record-breaker. Last year was the earth's hottest in 136 years of record-keeping, NASA and the National Oceanic and Atmospheric Administration (NOAA) announced Wednesday. The agencies agreed that 2015 was a record-breaker. NOAA found 2015 was 1.62 degrees Fahrenheit warmer than the 20th century average. Since the beginning of modern record keeping, Earth's temperature has risen about 1.8 degrees Fahrenheit, according to NASA, which attributed the change to "increased carbon dioxide and other human-made emissions into the atmosphere." The average global temperature of 58.24 degrees F. That was already 1.24 degrees above the 20th century average. "Globally averaged temperatures in 2015 shattered the previous mark set in 2014 by 0.23 degrees Fahrenheit (0.13 Celsius)," NASA reported. "Only once before, in 1998, has the new record been greater than the old record by this much." 2014, the previous hottest year, had an average global temperature of 58.24 degrees Fahrenheit. 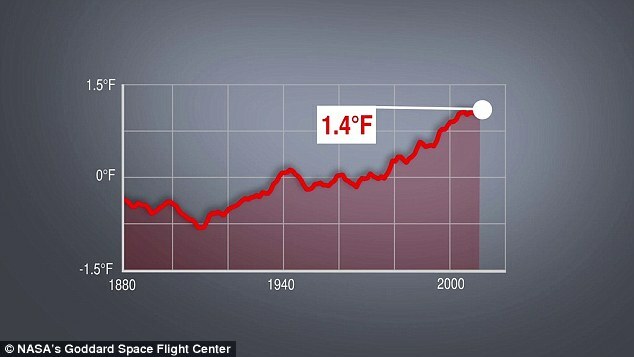 That was already 1.24 degrees above the 20th century average. The heat in 2015 can be attributed to both global warming caused by humans and the winter's powerful El Niño event, the World Meteorological Organization said in November. It noted record-high levels of greenhouse gases in the Northern hemisphere last year. Fourteen of the last 16 years have been the hottest ever recorded. Wednesday's announcement is backed up by the Berkeley Earth study released last week, which called 2015 "unambiguously the hottest year on record." "This new high temperature record confirms our previous interpretation that the pause was temporary and that global warming has not slowed," Richard Muller, scientific director of Berkeley Earth, said. (The "pause" was the dozen-plus years before 2014 when global temperatures basically held steady.) The decades-long rise due to greenhouse gas emission is now clearly continuing," added Robert Rohde, the lead scientist on the Berkeley Earth study. Democratic presidential candidate Sen. Bernie Sanders (I-Vt.) used the news to urge movement away from fossil fuels. "The debate is over," Sen. Bernie Sanders said. "Fourteen of the last 16 years have been the hottest ever recorded. Climate change is real and is caused by human activity. This planet and its people are in trouble. Unless we get our act together, we will see in years to come more droughts, more floods and more extreme weather disturbances." While 2015 was a record-breaking year for the planet, it was only the second-hottest year on record for the U.S., which NOAA reported earlier this month saw an average 54.4 degrees F last year. That was 2.4 degrees above the country's 20th century average, but 0.9 degrees under the record 55.3 degree average for 2012. NASA found that 2015 was 1.8 degrees Fahrenheit warmer than the late 19th century. 2015 was the hottest year on record. Experts have been estimating for months that last year would prove to be the world's hottest in over a century. After a NASA report found that this past October was the first month to surpass the 20th century's average temperature by more than 1 degree Celsius, Gavin Schmidt, director of the agency's Goddard Institute for Space Studies, tweeted there was now a 99.9 percent chance that 2015 would be crowned the hottest year on record. The severe heat was palpable around the planet. Heat Records Shattered in Germany, France, The Netherlands in June/July 2015 History's deadliest heat wave -- centered in France in 2003 -- killed 70,000 people across Europe. A dangerous heat wave scorching Europe shattered records and forced people to seek refuge. The heat broke records across Europe in June and July 2015, when triple-digit temperatures settled on Spain, Portugal, France, the United Kingdom, Germany and Poland. The heat wave in Euorpe in June and July 2015 smashed all-time records. Madrid (central Madrid) set a new July record high on July 6, topping out at 39.9 degrees Celsius -- 103.8 degrees Fahrenheit, exceeding the previous July record from July 24, 1995 (39.5C). They also set a June record high June 29, reaching 39.7 degrees Celsius -- 103.5 degrees Fahrenheit. Germany's all-time heat record was toppled July 5 in Kitzingen, topping out at 40.3 degrees Celsius (104.5 degrees Fahrenheit). This eclipsed the previous German all-time high of 40.2C (104.4F) from August 2003 and July 1983. German cities set their all-time heat records on the July 4-5 weekend, including Berlin (Dahlem) reaching 37.9C (100.2F) Saturday and Frankfurt soaring to 39C (102.2F) Sunday. Triple-digit temperatures baked Spain and Portugal before moving on to France, the United Kingdom, Germany, Poland and other areas of Europe. The temperature hit 100 degrees Fahrenheit in Paris in July. And then it kept rising.The official high was 103.5 degrees, just short of the hottest day ever recorded in the French capital. Electricity fluctuations caused by the excessive temperatures briefly blacked out power for 830,000 households on Tuesday night. Near France’s Atlantic coast in the southwestern part of the country, the temperatures rose as high as 108 degrees. Such a high temperature—more typical of California’s Death Valley at this time of year. Madrid set a new record for its June heat on Monday when temperatures reached 103.5 degrees Fahrenheit, and southern Spain's Cordoba experienced 110.7 degrees on Sunday. A heat of 98.1 degrees at London's Heathrow Airport on Wednesday set a new record for July heat in all of the U.K., while the 103.5 degrees recorded in Paris that same day was the hottest reading in the city since 1873. - Dieppe (38.3C / 100.9F) beat their previous record from July 19, 2006 (37C). - Melun (39.4C / 102.9F) beat their previous record from Aug. 12, 2003 (38.9C). a new national July heat record, topping Westdorpe's 37.1C reading in 2006. Heat records were broken in Spain. Madrid's Adolfo Suarez Madrid-Barajas Airport pushed up to 40 degrees Celsius (104 F), a first for June in records dating to 1945. Four other locations in Spain with records dating to at least the 1950s tied or set new June heat records. Cordoba, Spain, reached a sizzling 43.7 degrees Celsius (110.7F) and topped that July 6 with a high of 45 degrees Celsius (113F). Research suggests such extreme heat waves, including the one in India that killed more than 1,400 people last month, are largely the result of human-caused climate change. A study published last year in the journal Nature Climate Change found that Europe is now 10 times more likely to see another heat wave as intense as that of 2003 than it was one decade ago. Temperatures as hot as 36 degrees Celsius (about 97F) were reported in western Poland while Plzen-Mikulka, in the western Czech Republic topped out at 37.8 degrees C Sunday.Even parts of southern Sweden pushed the 32 degrees Celsius (89.6F).The temperature at London's Heathrow Airport skyrocketed to 36.7 degrees Celsius -- 98.1 degrees Fahrenheit -- a July heat record not only there but for anywhere in the U.K., according to the U.K. Met Office. The previous U.K. July heat record was set almost nine years ago -- 36.5 degrees C in Wisley on July 19, 2006. It was also the hottest day in Wimbledon history, topping the previous record of 34.6 degrees C on June 26, 1976. India and Pakistan: Record heat and floods kills thousands, displace millions. India's sweltering temperatures have caused 2,500 deaths so far. The temperatures were so hot they melted roads, reaching 45°C (113°F) in New Delhi. 120-degree days in India melted New Delhi's asphalt and killed around 2,500 people. In May, 120-degree days in India melted New Delhi's asphalt and killed around 2,500 people, making it the fifth-deadliest heat wave on record. The next month, temperatures as high as 113 degrees killed at least 1,200 people in Pakistan and sent more than 65,000 heatstroke patients to hospitals. 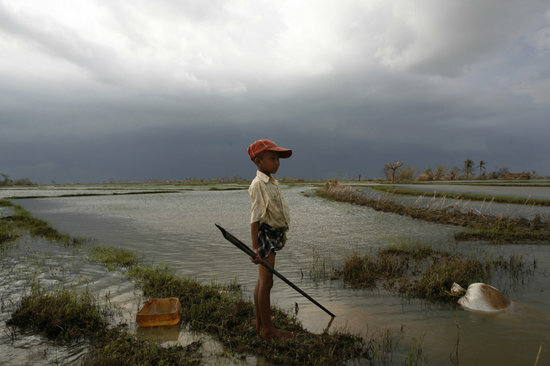 A boy whose house was destroyed by the cyclone watches an approaching storm. A boy whose house was destroyed by the cyclone watches an approaching storm, some 50 kilometres southwest of the township of Kunyangon. Further storms would complicate relief efforts and leave children increasingly vulnerable to disease. In May 2008 in Myanmar, an estimated 1.5 million people are struggling to survive under increasingly desperate conditions in the wake of Cyclone Nargis, which hit the southwestern coast on 3 May, killed some 100,000 people, and displaced 1 million across five states. Up to 5,000 square kilometres of the densely populated Irrawaddy Delta, which bore the brunt of the storm, remain underwater. In Pakistan, over 5.4 million people had been affected by monsoon rains and flooding, this number was expected to rise. In Sindh Province, 824,000 people have been displaced and at least 248 killed. Many government schools have been turned into temporary shelters, and countless water sources have been contaminated. More than 1.8 million people are living in makeshift camps without proper sanitation or access to safe drinking water. Over 70 per cent of standing crops and nearly 14,000 livestock have been destroyed in affected areas, where 80 per cent of the population relies on agriculture for food and income. Affected communities are also threatened by measles, hepatitis and other communicable diseases. The crisis comes one year after the country's 2010 monsoon-related flooding disaster, which covered up to one fifth of the country in flood water and affected more than 18 million people, half of them children. Many families are still recovering from the earlier emergency, which aggravated levels of chronic malnutrition and adversely affected sanitation access and other child protection issues. UNICEF is working with Government authorities and United Nations agencies and partners to provide relief. Thus far, UNICEF-supported programmes have immunized over 153,000 children and 14,000 women; provided nutritional screenings and treatments benefiting over 2,000 children; provided daily safe drinking water to 106,700 people; and constructed 400 latrines benefiting 35,000 people. Still, additional nutrition support and safe water and sanitation services are urgently needed. A joint United Nations Rapid Response Plan seeks US$356.7 million to address the needs of affected populations over the next six months. Africa: Drought affects food crops as millions go hungry. 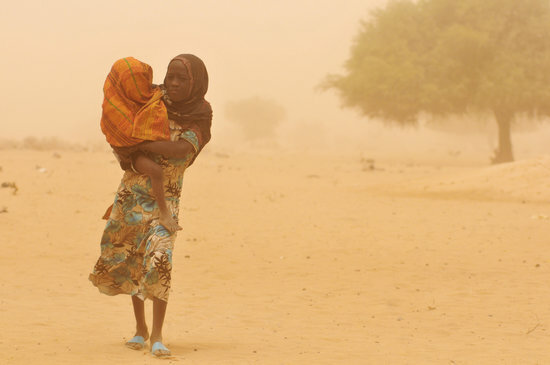 A girl carries her baby sibling through a haze of dust in Sidi Village, in Kanem Region. She is taking him to be screened for malnutrition at a mobile outpatient centre for children, operated by one nurse and four nutrition workers. The programme is new to the area. Several months ago, most children suffering from severe malnutrition had to be transported to health centres in the town of Mundo, 12 kilometres away, or in the city of Mao, some 35 kilometres away. In April 2010 in Chad, droughts have devastated local agriculture, causing chronic food shortages and leaving 2 million people in urgent need of food aid. Due to poor rainfall and low agricultural yields, malnutrition rates have hovered above emergency thresholds for a decade. But the 2009 harvest was especially poor, with the production of staple crops declining by 20 percent to 30 percent. Food stocks have since dwindled, and around 30 percent of cattle in the region have died from lack of vegetation. 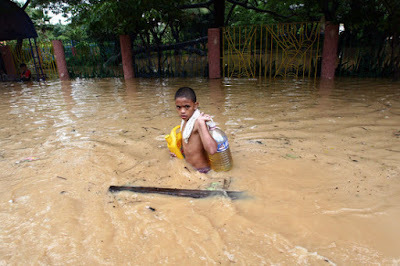 Philippines: Massive flooding affects millions. 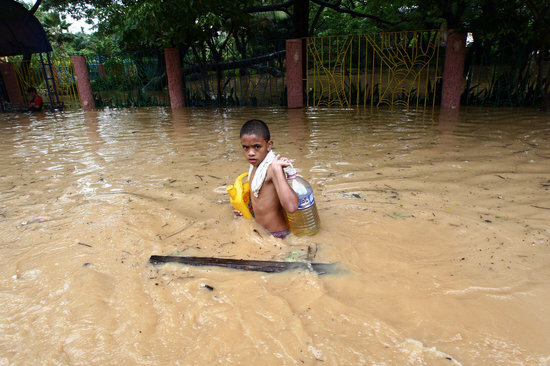 A boy carries supplies through waist-high floodwater in Pasig City in Manila, the capital. On Sept. 30, 2009, in the Philippines, over half a million people are displaced by flooding caused by Tropical Storm Ketsana, which struck on Sept. 26. The storm dumped over a month's worth of rain on the island of Luzon in only 12 hours. 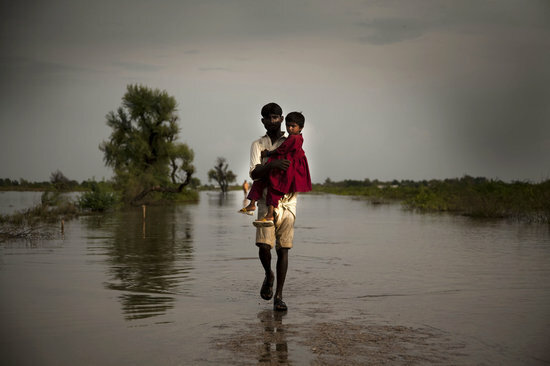 The flooding has affected some 1.8 million people, and the death toll has climbed to 246.